In this tutorial we will show you how to install and configuration of Gitlab on your Debian 9. For those of you who didn’t know, Gitlab is graphical implementation of git, it is an open source repository management and version control system. GitLab is developed on Ruby on Rails. Using GitLab you can host your source code on your own server. This ensures security of the code, and gives you total freedom on the number of users as well as number of repositories and number of files. 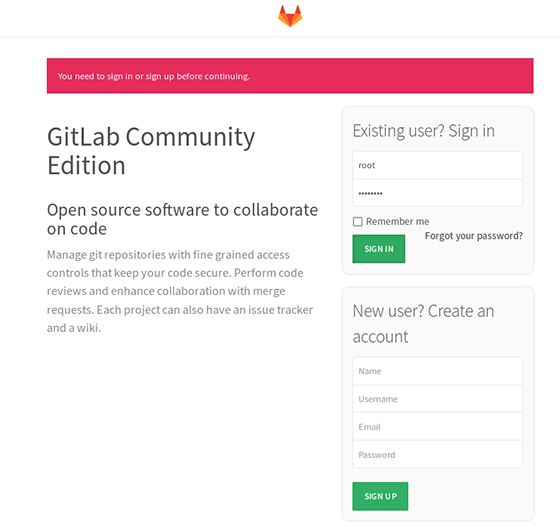 GitLab provides you with a platform to collaborate on projects and to keep track of changes in code. GitLab is widely used for software development and version control related tasks. In many ways it is similar to GitHub, except you can install it in your own server. This article assumes you have at least basic knowledge of Linux, know how to use the shell, and most importantly, you host your site on your own VPS. The installation is quite simple and assumes you are running in the root account, if not you may need to add ‘sudo’ to the commands to get root privileges. I will show you through the step by step installation Gitlab on a Ubuntu Debian 9 (Stretch) server. GitLab provides you web interface to edit files, directories and create merge requests. It is self hosted, hence you have full control over your server and the source code hosted inside. It provides LDAP user authentication and has two factor authentication system which makes the application very secure. You can insert your own branding in the login page and it also supports project import from GitHub and other sources to GitLab. It has lots of features like code reviews, issue tracking, activity feeds and inbuilt wiki. It provides a fine work flow management which gives you ability to create groups for a project, ability to fork a repository as well as it provides ability to manage large binaries with git LFS. GitLab comes with GitLab CI for continuous integration. You can also Docker with GitLab CI. It’s free and open source hence you won’t have to deal with any licensing issues. Step 4. Configure GitLab on Server. Gitlab will be available on HTTP port 80 by default. Open your favorite browser and navigate to http://yourdomain.com/ or http://server-ip. If you are using a firewall, please open port 80 to enable access to the control panel. Congratulation’s! You have successfully installed Gitlab. Thanks for using this tutorial for installing Gitlab on Debian 9 (Stretcht) system. For additional help or useful information, we recommend you to check the official Gitlab web site. Related Posts of "How To Install Gitlab on Debian 9 Stretch"